BEIJING, March 30 (Xinhua) -- Chinese President Xi Jinping held talks with visiting Serbian President Tomislav Nikolic on Thursday, agreeing to enhance cooperation within the Belt and Road Initiative and the "16+1" cooperation mechanism. China is willing to work with Serbia to deepen the all-weather friendship and mutually beneficial cooperation, said Xi. He urged the two sides to maintain high-level exchanges, as well as exchanges between governments, legislatures, political parties, and local governments. China hopes to strengthen the alignment of the Belt and Road Initiative and Serbia's strategy of reindustrialization, and advance big cooperative projects, such as the Serbia-Hungary railway, said Xi. He suggested the two sides discuss cooperation in building industrial parks to mutually promote infrastructure construction, production capacity cooperation and industry development. He also called on the two sides to beef up cooperation in agriculture, biomedicine and renewable energy, and expand exchanges in tourism and culture to reinforce friendship between people of the two countries. China expects Serbia to continue its role in promoting China-CEEC cooperation to better serve the interests of people of the two sides, said Xi. Nikolic said Serbian people admire the development achievements of China and hope that China will play a bigger role in international and regional affairs. Serbia appreciates China's adherence to mutual respect and equal treatment in developing relations with other countries, he said, noting that Serbia will always stick to the one-China policy. Serbia is ready to enhance pragmatic cooperation with China in infrastructure, production capacity, mining and agriculture, said Nikolic. He said Serbia will actively participate in the Belt and Road construction, deepen people-to-people exchanges and boost cooperation between CEE countries and China. After the talks, Xi attended a ceremony awarding the title of "honorary citizen of Beijing" to the Serbian President. 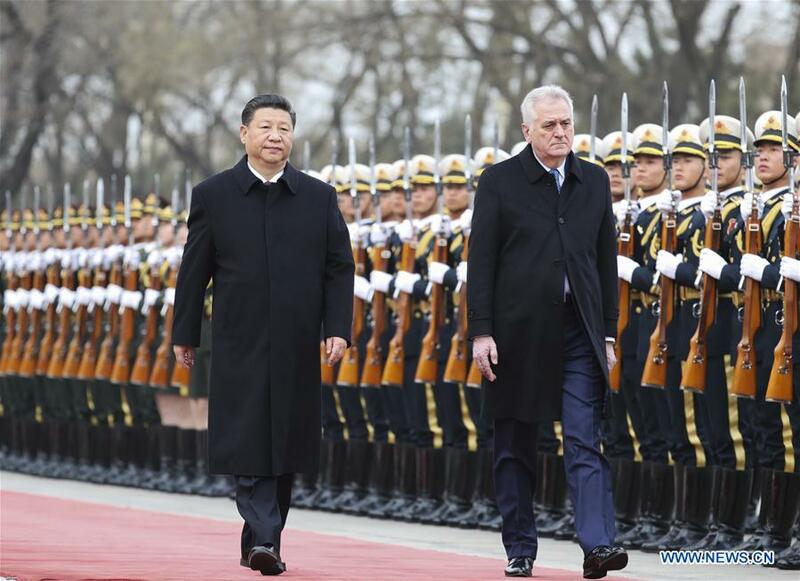 Prior to the talks, Xi held a red-carpet welcoming ceremony for Nikolic. Nikolic is paying a state visit to China from March 28 to April 1 at the invitation of Xi.